How To Sell More To Existing Customers? Did you know it is much easier to get existing customers to buy more from you than to get new customers to buy from you? Therefore, it is important that you stay connected with your existing customers and get them to buy more from you. But exactly how are you going to do that? Developing a loyalty membership for your store is a way to increase conversions from your current customers while rewarding them on their repeat purchases. higher discount rates for loyal customers. promote multiple purchases (buy 1 and get 50% on 2nd purchase). Points program – each purchase is worth points. When they have accumulated a certain number of points, they get rewarded. 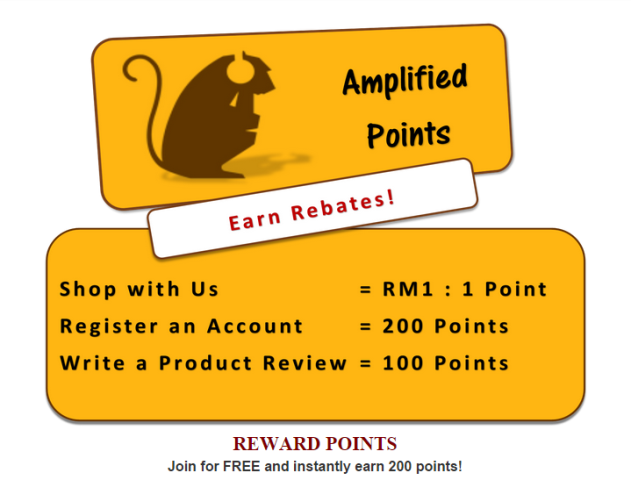 Amplified Headphones Store Loyalty Reward Points. Send promotional emails. Nothing entices a customer more than a great deal. If you keep your existing customers posted with all your store promotions, they might make their purchase again when they spot a good bargain. Your customers get to save some money and you get to make more sales. Not bad, right? Send new arrivals emails. When a hot new item, service or update arrives at your store, all you have to do is send out an email to spread the word about this new and must-have product. More importantly, remember to include a link so that your customers can click and make a purchase instantly. 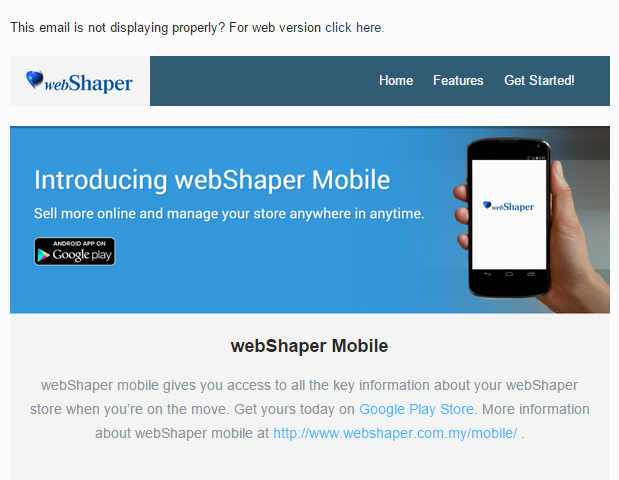 webShaper used newsletter to introduce the new mobile application to their customers. Send industry-related contents emails: If you keep sending your customers promotional or new arrivals emails, your customers might start unsubscribing or ignoring your emails when they feel overwhelmed with the frequency of your newsletter. To keep them interested, try sending them emails with contents related to your industry such as tips or related news. If you are in the fashion industry, you can probably share some fashion tips or even the latest fashion trend with your customers. They would definitely appreciate this since it is educational and also entertaining at the same time. Sending a small gift to your customers can be a great way to remind them to come back while adding the element of surprise and impress. You’ll never know, customers might just respond to your positive gesture with another positive gesture by buying from you again. It can be anything as simple as a gift certificate to your store, or you can take a step further by sending your customers something that lets them know you went the extra mile because they are important to you. When the customer is impressed with your small gesture, that customer also became an incredible referral for your brand. We all know how powerful word-of-mouth marketing is. The more referral you get, the more sales you make! So, how do you make sure that you stay in your customers’ mind and keep all forms of communications open even after they left your website? This is where customer retention via social media comes in. While email marketing has been the favoured tool of the Internet marketers, social media cannot be ignored these days. People today are always connected on social media like Facebook, Twitter and Instagram. Getting existing customers to like, follow and subscribe to you gives you the opportunity to continue to engage with them. You can build a relationship by better understanding them through listening and helping them. When they feel satisfied and comfortable with your service, they will be coming back to buy more from you. 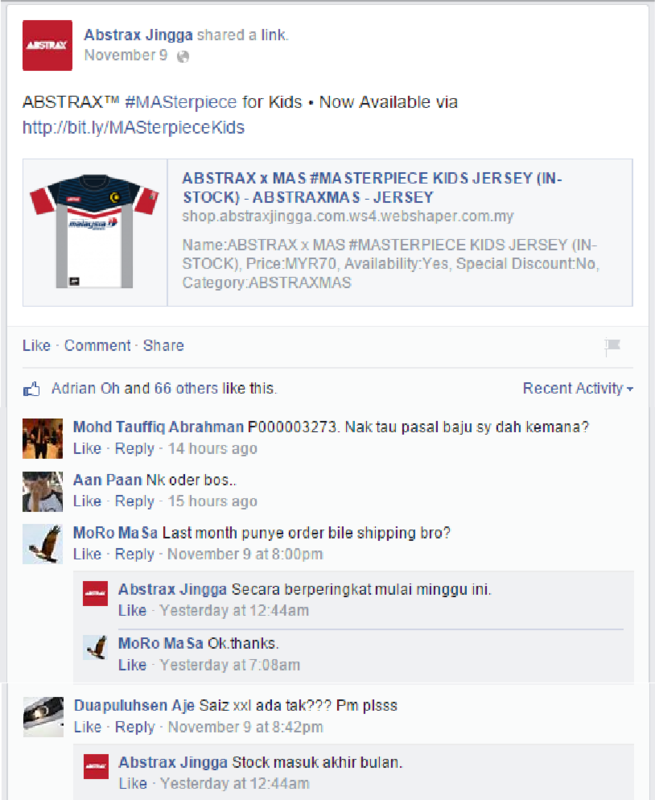 Notice how Abstrax Jingga engage with their customers on Facebook? They listened and answered to all their customers enquiries.